Whether you’re looking to lose weight, manage diabetes, reduce risks of cancer and heart disease, mitigate autoimmune disease, improve performance or simply want to experience the best health possible, a diet that is abundant in all the micronutrients that our bodies need and that simultaneously omits foods known to be problematic for health is your best bet. What Does this Diet Look Like? Its foundation is the most nutrient-dense foods available to us, including organ meat, seafood, and both huge variety and copious quantities of vegetables, with other quality meats, fruit, eggs, nuts, seeds, healthy fats, probiotic and fermented foods, herbs and spices to round it out. At the same time, it omits foods known to be inflammatory, disrupt hormones, or negatively impact the health of the gut, including all grains, most legumes, conventional dairy products, and all processed and refined foods. Yes, this is the Paleo template. To recap, Paleo is a nutrient-focused whole-foods diet, with the goal to maximize foods that heal and minimize foods that harm. It improves health by providing balanced and complete nutrition while avoiding most processed and refined foods and empty calories. It’s not a way to simply lose pounds quickly (even though you can), and it’s not a fad that dissolves under scientific scrutiny; rather, every Paleo principle is rooted solidly in the latest research and data. 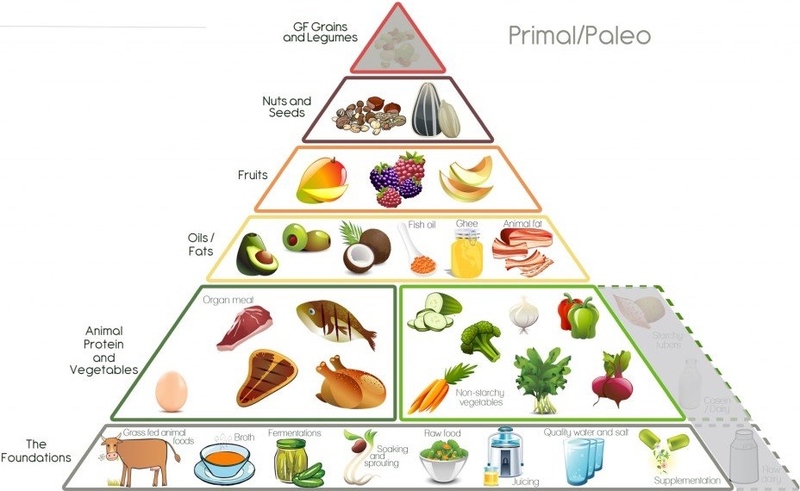 What can I eat on paleo diet? A plant-based diet is at the core of the Paleo diet, with two thirds or more of every Paleo meal consisting of plant foods and only one third of every plate taken up by animal foods. Meat consumption is enthusiastically endorsed as well because it provides vital nutrients not obtainable from plant sources. Sourcing the highest quality food you can is very much encouraged, meaning choosing grass-fed or pasture-raised meats, wild-caught seafood, and local organic fruits and vegetables whenever possible. What can I not eat on the paleo diet? Foods that are eliminated in the Paleo diet are the ones that provide our bodies with little to no nutrition, and that are difficult to digest (which can cause gut health problems and contribute to gut dysbiosis), and have the ability to stimulate inflammation or disrupt important hormones. There are many foods that can cause addition problems, especially for those with chronic health conditions (see the Autoimmune Protocol). The Paleo diet, is not a historical reenactment of our paleolithic ancestors from the Stone Age. It’s not an all-meat or meat-heavy diet as it is sometimes portrayed, and in fact, the Paleo diet puts great emphasis on eating tons of veggie. The Paleo diet is notzero-carb, low-carb or ketogenic die. Healthy sources of Paleo carbohydrates include fruit (apples, bananas, melons, berries, citrus, plantains… and root vegetables (sweet potatoes, squash, parsnips, yucca…). The Paleo diet is also not just a diet. Most people refer to it as the Paleo lifestyle or Paleo template to emphasize that this is a way of living, not a diet that you go on for a few months to lose a couple pounds, and that it incorporates equal focus on lifestyle factors (like sleep, stress management, activity and community), sustainability, regenerative farming practices, and environmental protection.